Funk N, Munz M, Ott T, Brockmann K, Wenninger-Weinzierl A, Kühn R, Vogt-Weisenhorn D, Giesert F, Wurst W, Gasser T, Biskup S. The Parkinson’s disease-linked Leucine-rich repeat kinase 2 (LRRK2) is required for insulin-stimulated translocation of GLUT4. Sci Rep. 2019 Mar 14;9(1):4515. doi: 10.1038/s41598-019-40808-y. PMID: 30872638 [PubMed – in process] Abstract. Miyake Y, Shiroyama N, Horiguchi M, Saito A, Yagasaki K. Bull’s-eye maculopathy and negative electroretinogram. Retina 1989;9(3):210-5. PMID: 2595114 [PubMed – indexed for MEDLINE] Abstract. Fan C, Kuhn M, Mbiol AP, Groome J, Winston V, Biskup S, Lehmann-Horn F, Jurkat-Rott K.. Kir2.2 p.Thr140Met: a genetic susceptibility to sporadic periodic paralysis. Acta Myol. 2018 Sep 1;37(3):193-203. eCollection 2018 Sep. PMID: 30838349 [PubMed – in process] Abstract. Rydning SL, Dudesek A, Rimmele F, Funke C, Krüger S, Biskup S, Vigeland MD, Hjorthaug HS, Sejersted Y, Tallaksen C, Selmer KK, Kamm C. A novel heterozygous variant in ERLIN2 causes autosomal dominant pure hereditary spastic paraplegia. Eur J Neurol. 2018 Jul;25(7):943-e71. doi: 10.1111/ene.13625. Epub 2018 Apr 15. PMID: 29528531 [PubMed – indexed for MEDLINE] Abstract. 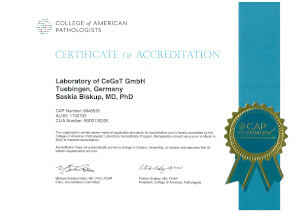 Hickmann AK, Frick M, Hadaschik D, Battke F, Bittl M, Ganslandt O, Biskup S, Döcker D. Molecular tumor analysis and liquid biopsy: a feasibility investigation analyzing circulating tumor DNA in patients with central nervous system lymphomas. BMC Cancer. 2019 Mar 1;19(1):192. doi: 10.1186/s12885-019-5394-x.PMID: 30823914 [PubMed – in process] Abstract. Garrett L, Becker L, Rozman J, Puk O, Stoeger T, Yildirim AÖ, Bohla A, Eickelberg O, Hans W, Prehn C, Adamski J, Klopstock T, Rácz I, Zimmer A, Klingenspor M, Fuchs H, Gailus-Durner V, Wurst W, Hrabě de Angelis M, Graw J, Hölter SM. Fgf9 Y162C Mutation Alters Information Processing and Social Memory in Mice. Mol Neurobiol. 2018 Jun;55(6):4580-4595. doi: 10.1007/s12035-017-0659-3. Epub 2017 Jul 10. PMID: 28695538 [PubMed – indexed for MEDLINE] Abstract. Nasser F, Mulahasanovic L, Alkhateeb M, Biskup S, Stingl K, Zrenner. Hypotrichosis with cone-rod dystrophy in a patient with cadherin 3 (CDH3) mutation. Doc Ophthalmol. 2019 Feb 1. doi: 10.1007/s10633-019-09675-w. [Epub ahead of print] PMID: 30710256 [PubMed – as supplied by publisher]. Abstract. Kathrin Klein, Roman Tremmel, Stefan Winter, Sarah Fehr, Florian Battke, Tim Scheurenbrand , Elke Schaeffeler, Saskia Biskup, Matthias Schwab and Ulrich M. Zanger. A New Panel-Based Next-Generation Sequencing Method for ADME Genes Reveals Novel Associations of Common and Rare Variants With Expression in a Human Liver Cohort Front. Genet., 31 January 2019 Abstract. Kuehlewein L, Schöls L, Llavona P, Grimm A, Biskup S, Zrenner E, Kohl S. Phenotypic spectrum of autosomal recessive retinitis pigmentosa without posterior column ataxia caused by mutations in the FLVCR1 gene. Graefes Arch Clin Exp Ophthalmol. 2019 Jan 17. doi: 10.1007/s00417-018-04233-7. [Epub ahead of print] PMID: 30656474 [PubMed – as supplied by publisher] Abstract. Sandestig A, Green A, Jonasson J, Vogt H, Wahlström J, Pepler A, Ellnebo K, Biskup S, Stefanova M. Could Dissimilar Phenotypic Effects of ACTB Missense Mutations Reflect the Actin Conformational Change? Two Novel Mutations and Literature Review. Mol Syndromol. 2019 Jan;9(5):259-265. doi: 10.1159/000492267. Epub 2018 Aug 9. PMID: 30733661 [PubMed] Abstract. Platzer K, Sticht H, Edwards SL, Allen W, Angione KM, Bonati MT, Brasington C, Cho MT, Demmer LA, Falik-Zaccai T, Gamble CN, Hellenbroich Y, Iascone M, Kok F, Mahida S, Mandel H, Marquardt T, McWalter K, Panis B, Pepler A, Pinz H, Ramos L, Shinde DN, Smith-Hicks C, Stegmann APA, Stöbe P, Stumpel CTRM, Wilson C, Lemke JR, Di Donato N, Miller KG, Jamra R.De Novo Variants in MAPK8IP3 Cause Intellectual Disability with Variable Brain Anomalies. Am J Hum Genet. 2018 Dec 31. pii: S0002-9297(18)30459-2. doi: 10.1016/j.ajhg.2018.12.008. [Epub ahead of print] PMID: 30612693 [PubMed – as supplied by publisher] Abstract. Schene IF, Korenke CG, Huidekoper HH, van der Pol L, Dooijes D, Breur JMPJ, Biskup S, Fuchs SA, Visser G.Glycogen Storage Disease Type IV: A Rare Cause for Neuromuscular Disorders or Often Missed? JIMD Rep. 2018 Dec 20. doi: 10.1007/8904_2018_148. [Epub ahead of print] PMID: 30569318 [PubMed – as supplied by publisher] Abstract. Strehlow V, Heyne HO, Vlaskamp DRM, Marwick KFM, Rudolf G, de Bellescize J, Biskup S, Brilstra EH, Brouwer OF, Callenbach PMC, Hentschel J, Hirsch E, Kind PC, Mignot C, Platzer K, Rump P, Skehel PA, Wyllie DJA; GRIN2A study group , Hardingham GE, van Ravenswaaij-Arts CMA, Lesca G, Lemke JR. GRIN2A-related disorders: genotype and functional consequence predict phenotype. Brain. 2018 Dec 12. doi: 10.1093/brain/awy304. [Epub ahead of print] PMID: 30544257 [PubMed – as supplied by publisher] Abstract. Zagaglia S, Selch C, Nisevic JR, Mei D, Michalak Z, Hernandez-Hernandez L, Krithika S, Vezyroglou K, Varadkar SM, Pepler A, Biskup S, Leão M, Gärtner J, Merkenschlager A, Jaksch M, Møller RS, Gardella E, Kristiansen BS, Hansen LK, Vari MS, Helbig KL, Desai S, Smith-Hicks CL, Hino-Fukuyo N, Talvik T, Laugesaar R, Ilves P, Õunap K, Körber I, Hartlieb T, Kudernatsch M, Winkler P, Schimmel M, Hasse A, Knuf M, Heinemeyer J, Makowski C, Ghedia S, Subramanian GM, Striano P, Thomas RH, Micallef C, Thom M, Werring DJ, Kluger GJ, Cross JH, Guerrini R, Balestrini S, Sisodiya SM. Neurologic phenotypes associated with COL4A1/2 mutations: Expanding the spectrum of disease. Neurology. 2018 Nov 9. pii: 10.1212/WNL.0000000000006567. doi: 10.1212/WNL.0000000000006567. [Epub ahead of print]. PMID: 30413629 [PubMed – as supplied by publisher]. Abstract. Helbig KL, Lauerer RJ, Bahr JC, Souza IA, Myers CT, Uysal B, Schwarz N, Gandini MA, Huang S, Keren B, Mignot C, Afenjar A, Billette de Villemeur T, Héron D, Nava C, Valence S, Buratti J, Fagerberg CR, Soerensen KP, Kibaek M, Kamsteeg EJ, Koolen DA, Gunning B, Schelhaas HJ, Kruer MC, Fox J, Bakhtiari S, Jarrar R, Padilla-Lopez S, Lindstrom K, Jin SC, Zeng X, Bilguvar K, Papavasileiou A, Xin Q, Zhu C, Boysen K, Vairo F, Lanpher BC, Klee EW, Tillema JM, Payne ET, Cousin MA, Kruisselbrink TM, Wick MJ, Baker J, Haan E, Smith N, Corbett MA, MacLennan AH, Gecz J, Biskup S, Goldmann E, Rodan LH, Kichula E, Segal E, Jackson KE, Asamoah A, Dimmock D, McCarrier J, Botto LD, Filloux F, Tvrdik T, Cascino GD, Klingerman S, Neumann C, Wang R, Jacobsen JC, Nolan MA, Snell RG, Lehnert K, Sadleir LG, Anderlid BM, Kvarnung M, Guerrini R, Friez MJ, Lyons MJ, Leonhard J, Kringlen G, Casas K, El Achkar CM, Smith LA, Rotenberg A, Poduri A, Sanchis-Juan A, Carss KJ, Rankin J, Zeman A, Raymond FL, Blyth M, Kerr B, Ruiz K, Urquhart J, Hughes I, Banka S; Deciphering Developmental Disorders Study, Hedrich UBS, Scheffer IE, Helbig I, Zamponi GW, Lerche H, Mefford HC. De Novo Pathogenic Variants in CACNA1E Cause Developmental and Epileptic Encephalopathy with Contractures, Macrocephaly, and Dyskinesias. Am J Hum Genet. 2018 Oct 10. pii: S0002-9297(18)30317-3. doi: 10.1016/j.ajhg.2018.09.006. [Epub ahead of print] PMID: 30343943 [PubMed – as supplied by publisher]. Abstract. Metz KA, Teng X, Coppens I, Lamb HM, Wagner BE, Rosenfeld JA, Chen X, Zhang Y, Kim HJ, Meadow ME, Wang TS, Haberlandt ED, Anderson GW, Leshinsky-Silver E, Bi W, Markello TC, Pratt M, Makhseed N, Garnica A, Danylchuk NR, Burrow TA, Jayakar P, McKnight D, Agadi S, Gbedawo H, Stanley C, Alber M,Prehl I, Peariso K, Ong MT, Mordekar SR, Parker MJ, Crooks D, Agrawal PB, Berry GT, Loddenkemper T, Yang Y, Maegawa GHB, Aouacheria A, Markle JG, Wohlschlegel JA, Hartman AL, Hardwick JM. KCTD7 deficiency defines a distinct neurodegenerative disorder with a conserved autophagy-lysosome defect. Ann Neurol. 2018 Oct 8. doi: 10.1002/ana.25351. [Epub ahead of print] PMID: 30295347 [PubMed – as supplied by publisher]. Abstract. Traschütz A, Hayer SN, Bender B, Schöls L, Biskup S, Synofzik M. TSFM mutations cause a complex hyperkinetic movement disorder with strong relief by cannabinoids. Parkinsonism Relat Disord. 2018 Sep 29. pii: S1353-8020(18)30427-9. doi: 10.1016/j.parkreldis.2018.09.031. [Epub ahead of print] No abstract available. PMID: 30297209 [PubMed – as supplied by publisher]. Roovers EF, Kaaij LJT, Redl S, Bronkhorst AW, Wiebrands K, de Jesus Domingues AM, Huang HY, Han CT, Riemer S, Dosch R, Salvenmoser W, Grün D, Butter F, van Oudenaarden A, Ketting RF. Tdrd6a Regulates the Aggregation of Buc into Functional Subcellular Compartments that Drive Germ Cell Specification. Dev Cell. 2018 Aug 6;46(3):285-301.e9. doi: 10.1016/j.devcel.2018.07.009. PMID: 30086300 [PubMed – in process]. Abstract. Weisschuh N, Stingl K, Audo I, Biskup S, Bocquet B, Branham K, Burstedt MS, De Baere E, De Vries MJ, Golovleva I, Green A, Heckenlively J, Leroy BP, Meunier I, Traboulsi E, Wissinger B, Kohl S. Mutations in the gene PDE6C encoding the catalytic subunit of the cone photoreceptor phosphodiesterase in patients with achromatopsia. Hum Mutat. 2018 Aug 6. doi: 10.1002/humu.23606. [Epub ahead of print] PMID: 30080950 [PubMed – as supplied by publisher]. Abstract. Navarro Moreno C, Delestienne A, Marbaix E, Aydin S, Hörtnagel K, Lechner S, Sznajer Y, Beauloye V, Maiter D, Lysy PA. Familial Forms of Cushing Syndrome in Primary Pigmented Nodular Adrenocortical Disease Presenting with Short Stature and Insidious Symptoms: A Clinical Series. Horm Res Paediatr. 2018 Jun 15:1-11. doi: 10.1159/000488761. [Epub ahead of print] PMID: 29909407 [PubMed – as supplied by publisher]. Abstract. Zobor D, Zobor G, Hipp S, Baumann B, Weisschuh N, Biskup S, Sliesoraityte I, Zrenner E, Kohl S. Phenotype Variations Caused by Mutations in the RP1L1 Gene in a Large Mainly German Cohort. Invest Ophthalmol Vis Sci. 2018 Jun 1;59(7):3041-3052. doi: 10.1167/iovs.18-24033. PMID: 30025130 [PubMed – in process]. Abstract. Nasser F, Weisschuh N, Maffei P, Milan G, Heller C, Zrenner E, Kohl S, Kuehlewein L. Ophthalmic features of cone-rod dystrophy caused by pathogenic variants in the ALMS1 gene. Acta Ophthalmol. 2018 Jun;96(4):e445-e454. doi: 10.1111/aos.13612. Epub 2017 Nov 30. PMID: 29193673 [PubMed – indexed for MEDLINE]. Abstract. Thomas C, Zühlsdorf A, Hörtnagel K, Mulahasanovic L, Grauer OM, Kümpers P, Wiendl H, Meuth SG. A Novel PKD1 Mutation Associated With Autosomal Dominant Kidney Disease and Cerebral Cavernous Malformation. Front Neurol. 2018 May 25;9:383. doi: 10.3389/fneur.2018.00383. eCollection 2018. PMID: 29887830 [PubMed]. Abstract. Pomarino D, Martin S, Pomarino A, Morigeau S, Biskup S. McArdle’s disease: A differential diagnosis of idiopathic toe walking. J Orthop. 2018 May 8;15(2):685-689. doi: 10.1016/j.jor.2018.05.024. eCollection 2018 Jun. PMID: 29881221 [PubMed]. Abstract. Wawrocka A, Skorczyk-Werner A, Wicher K, Niedziela Z, Ploski R, Rydzanicz M, Sykulski M, Kociecki J, Weisschuh N, Kohl S, Biskup S, Wissinger B, Krawczynski MR. Novel variants identified with next-generation sequencing in Polish patients with cone-rod dystrophy. Mol Vis. 2018 Apr 26;24:326-339. eCollection 2018. PMID: 29769798 [PubMed – in process]. Abstract. Rydning SL, Dudesek A, Rimmele F, Funke C, Krüger S, Biskup S, Vigeland MD, Hjorthaug HS, Sejersted Y, Tallaksen C, Selmer KK, Kamm C. A novel heterozygous variant in ERLIN2 causes autosomal dominant pure hereditary spastic paraplegia. Eur J Neurol. 2018 Mar 12. doi: 10.1111/ene.13625. [Epub ahead of print] PMID: 29528531 [PubMed – as supplied by publisher]. Abstract. Walter D, Harter PN, Battke F, Winkelmann R, Schneider M, Holzer K, Koch C, Bojunga J, Zeuzem S, Hansmann ML, Peveling-Oberhag J, Waidmann O. Genetic heterogeneity of primary lesion and metastasis in small intestine neuroendocrine tumors. Sci Rep. 2018 Feb 28;8(1):3811. doi: 10.1038/s41598-018-22115-0. PMID: 29491456 [PubMed – in process]. Abstract. Sonntag K, Hashimoto H, Eyrich M, Menzel M, Schubach M, Döcker D, Battke F, Courage C, Lambertz H, Handgretinger R, Biskup S, Schilbach K. Immune monitoring and TCR sequencing of CD4 T cells in a long term responsive patient with metastasized pancreatic ductal carcinoma treated with individualized, neoepitope-derived multipeptide vaccines: a case report. J Transl Med. 2018 Feb 6;16(1):23. doi: 10.1186/s12967-018-1382-1. PMID: 29409514 [PubMed – in process]. Abstract. Wilke C, Baets J, De Bleecker JL, Deconinck T, Biskup S, Hayer SN, Züchner S, Schüle R, De Jonghe P, Synofzik M. Beyond ALS and FTD: the phenotypic spectrum of TBK1 mutations includes PSP-like and cerebellar phenotypes. Neurobiol Aging. 2018 Feb;62:244.e9-244.e13. doi: 10.1016/j.neurobiolaging.2017.10.010. Epub 2017 Oct 24. PMID: 29137817 [PubMed – indexed for MEDLINE]. Abstract. Schänzer A, Rupp S, Gräf S, Zengeler D, Jux C, Akintürk H, Gulatz L, Mazhari N, Acker T, Van Coster R, Garvalov BK, Hahn A. Dysregulated autophagy in restrictive cardiomyopathy due to Pro209Leu mutation in BAG3. Mol Genet Metab. 2018 Jan 6. pii: S1096-7192(17)30596-6. doi: 10.1016/j.ymgme.2018.01.001. [Epub ahead of print] PMID: 29338979 [PubMed – as supplied by publisher]. Abstract. Mitter D, Pringsheim M, Kaulisch M, Plümacher KS, Schröder S, Warthemann R, Abou Jamra R, Baethmann M, Bast T, Büttel HM, Cohen JS, Conover E, Courage C, Eger A, Fatemi A, Grebe TA, Hauser NS, Heinritz W, Helbig KL, Heruth M, Huhle D, Höft K, Karch S, Kluger G, Korenke GC, Lemke JR, Lutz RE, Patzer S, Prehl I, Hoertnagel K, Ramsey K, Rating T, Rieß A, Rohena L, Schimmel M, Westman R, Zech FM, Zoll B, Malzahn D, Zirn B, Brockmann K. FOXG1 syndrome: genotype-phenotype association in 83 patients with FOXG1 variants. Genet Med. 2018 Jan;20(1):98-108. doi: 10.1038/gim.2017.75. Epub 2017 Jun 29. PMID: 28661489 [PubMed – indexed for MEDLINE]. Abstract. Tomcikova D, Gerinec A, Busanyova B, Gresikova M, Biskup S, Hortnagel K. Why is it necessary to examine retina when the patient suffers from aplastic anemia? Bratisl Lek Listy. 2018;119(5):275-277. doi: 10.4149/BLL_2018_051. PMID: 29749240 [PubMed – in process]. Abstract. Catarino CB, Vollmar C, Küpper C, Seelos K, Gallenmüller C, Bartkiewicz J, Biskup S, Hörtnagel K, Klopstock T. Brain diffusion tensor imaging changes in cerebrotendinous xanthomatosis reversed with treatment. J Neurol. 2017 Dec 19. Doi: 10.1007/s00415-0178711-9. [Epub ahead of print] PMID: 29260356 [PubMed- as supplied by publisher]. Abstract. Grzybowski M, Schänzer A, Pepler A, Heller C,Neubauer BA, Hahn A. Novel STAC3 Mutations in the First Non-Amerindian Patient with Native American Myopathy. Neuropediatrics. 2017 Dec;48(6):451-455. doi: 10.1055/s-0037-1601868. Epub 2017 Apr 15. PMID: 28411587 [PubMed- as supplied by publisher] Abstract. Dohrn MF, Glöckle N, Mulahasanovic L, Heller C, Mohr J, Bauer C, Riesch E, Becker A, Battke F, Hörtnagel K, Hornemann T, Suriyanarayanan S, Blankenburg M, Schulz JB, Claeys KG, Gess B, Katona I, Ferbert A, Vittore D, Grimm A, Wolking S, Schöls L, Lerche H, Korenke GC, Fischer D, Schrank B, Kotzaeridou U, Kurlemann G, Dräger B, Schirmacher A, Young P, Schlotter-Weigel B, Biskup S. Frequent genes in rare diseases: panel-based next generation sequencing to disclose causal mutations in hereditary neuropathies. J Neurochem. 2017 Dec;143(5):507-522. doi: 10.1111/jnc.14217.Epub 2017 Nov 7. PMID:28902413 [PubMed – endexed for MEDLINE]. Abstract. Bock AS, Günther S, Mohr J, Goldberg LV, Jahic A, Klisch C, Hübner CA, Biskup S, Beetz C. A nonstop variant in REEP1 causes peripheral neuropathy by unmasking a 3’UTR-encoded, aggregation-inducing motif. Hum Mutat. 2017 Nov 9. doi: 10.1002/humu.23369. [Epub ahead of print] Abstract. Niturad CE, Lev D, Kalscheuer VM, Charzewska A, Schubert J, Lerman-Sagie T, Kroes HY, Oegema R, Traverso M, Specchio N, Lassota M, Chelly J, Bennett-Back O, Carmi N, Koffler-Brill T, Iacomino M, Trivisano M, Capovilla G, Striano P, Nawara M, Rzonca S, Fischer U, Bienek M, Jensen C, Hu H, Thiele H, Altmüller J, Krause R, May P, Becker F; EuroEPINOMICS Consortium, Balling R, Biskup S, Haas SA, Nürnberg P, van Gassen KLI, Lerche H, Zara F, Maljevic S, Leshinsky-Silver E. Rare GABRA3 variants are associated with epileptic seizures, encephalopathy and dysmorphic features.Brain. 2017 Oct 7. doi: 10.1093/brain/awx236. [Epub ahead of print]PMID: 29053855. Abstract. Moawia A, Shaheen R, Rasool S, Waseem SS, Ewida N, Budde B, Kawalia A, Motameny S, Khan K, Fatima A, Jameel M, Ullah F, Akram T, Ali Z, Abdullah U, Irshad S, Höhne W, Noegel AA, Al-Owain M, Hörtnagel K, Stöbe P, Baig SM, Nürnberg P, Alkuraya FS, Hahn A, Hussain MS. Mutations of KIF14 Cause Primary Microcephaly by Impairing Cytokinesis. Ann Neurol. 2017 Sep 11. doi: 10.1002/ana.25044. Abstract. Syrbe S, Harms FL, Parrini E, Montomoli M, Mütze U, Helbig KL, Polster T, Albrecht B, Bernbeck U, van Binsbergen E, Biskup S, Burglen L, Denecke J, Heron B, Heyne HO, Hoffmann GF, Hornemann F, Matsushige T, Matsuura R, Kato M, Korenke GC, Kuechler A, Lämmer C, Merkenschlager A, Mignot C, Ruf S, Nakashima M, Saitsu H, Stamberger H, Pisano T, Tohyama J, Weckhuysen S, Werckx W, Wickert J, Mari F, Verbeek NE, Møller RS, Koeleman B, Matsumoto N, Dobyns WB, Battaglia D, Lemke JR, Kutsche K, Guerrini R. Delineating SPTAN1 associated phenotypes: from isolated epilepsy to encephalopathy with progressive brain atrophy.Brain. 2017 Sep 1;140(9):2322-2336. doi: 10.1093/brain/awx195. PMID: 29050398. Abstract. Catarino CB, Ahting U, Gusic M, Iuso A, Repp B, Peters K, Biskup S, von Livonius B, Prokisch H, Klopstock T. Characterization of a Leber’s hereditary optic neuropathy (LHON) family harboring two primary LHON mutations m.11778G>A and m.14484T>C of the mitochondrial DNA. Mitochondrion. 2017 Sep;36:15-20. doi: 10.1016/j.mito.2016.10.002. Epub 2016 Oct 6. PMID: 27721048 [PubMed – indexed for MEDLINE]. Abstract. Hermann A, Kitzler HH, Pollack T, Biskup S, Krüger S, Funke C, Terrile C, Haack TB. A Case of Beta-propeller Protein-associated Neurodegeneration due to a Heterozygous Deletion of WDR45.Tremor Other Hyperkinet Mov (N Y). 2017 Aug 8;7:465. doi: 10.7916/D8251WB0. eCollection 2017. PMID: 29082105 [PubMed – indexed for MEDLINE]. Abstract. Montagnese F, Klupp E, Karampinos DC,Biskup S, Gläser D, Kirschke JS, Schoser B. Two patients with GMPPB mutation: The overlapping phenotypes of limb-girdle myasthenic syndrome and limb-girdle muscular dystrophy dystroglycanopathy.Muscle Nerve. 2017 Aug;56(2):334-340. doi: 10.1002/mus.25485. Epub 2017 Feb 23. Abstract. Stingl K, Mayer AK, Llavona P, Mulahasanovic L, Rudolph G, Jacobson SG, Zrenner E, Kohl S, Wissinger B, Weisschuh N. CDHR1 mutations in retinal dystrophies. Sci Rep. 2017 Aug 1;7(1):6992. doi: 10.1038/s41598-017-07117-8. Abstract. Blauwendraat C, Wilke C, Simón-Sánchez J, Jansen IE, Reifschneider A, Capell A, Haass C, Castillo-Lizardo M, Biskup S, Maetzler W, Rizzu P, Heutink P, Synofzik M. The wide genetic landscape of clinical frontotemporal dementia: systematic combined sequencing of 121 consecutive subjects. Genet Med. 2017 Jul 27. doi: 10.1038/gim.2017.102. [Epub ahead of print] PMID: 28749476. Abstract. Smogavec M, Zschüntzsch J, Kress W, Mohr J, Hellen P, Zoll B, Pauli S, Schmidt J. Novel fukutin mutations in limb-girdle muscular dystrophy type 2M with childhood onset. Neurol Genet. 2017 Jul 10;3(4):e167. doi: 10.1212/NXG.0000000000000167. eCollection 2017 Aug. Abstract. Mitter D, Pringsheim M, Kaulisch M, Plümacher KS, Schröder S, Warthemann R, Abou Jamra R, Baethmann M, Bast T, Büttel HM, Cohen JS, Conover E, Courage C, Eger A, Fatemi A, Grebe TA, Hauser NS, Heinritz W, Helbig KL, Heruth M, Huhle D, Höft K, Karch S, Kluger G, Korenke GC, Lemke JR, Lutz RE, Patzer S, Prehl I, Hoertnagel K, Ramsey K, Rating T, Rieß A, Rohena L, Schimmel M, Westman R, Zech FM, Zoll B, Malzahn D, Zirn B, Brockmann K. FOXG1 syndrome: genotype-phenotype association in 83 patients with FOXG1 variants. Genet Med. 2017 Jun 29. doi: 10.1038/gim.2017.75. [Epub ahead of print] PMID: 28661489. Abstract. Weber YG, Biskup S, Helbig KL, Von Spiczak S, Lerche H. The role of genetic testing in epilepsy diagnosis and management. Expert Rev Mol Diagn. 2017 Jun 26:1-12. doi: 10.1080/14737159.2017.1335598. [Epub ahead of print] PMID: 28548558. Abstract. Von Stülpnagel C, Ensslen M, Møller RS, Masnada S, Veggiotti P, Piazza E, Dreesmann M, Hartlieb T, Herberhold T, Hughes E, Koch M, Kutzer C, Hörtnagel K, Nitanda J, Pohl M, Rostásy K, Haack TB, Stöhr K, Kluger G, Borggraefe I. Epilepsy in patients with GRIN2A alterations: Genetics, neurodevelopment, epileptic phenotype and response to anticonvulsive drugs. Eur J Paediatr Neurol. 2017 May;21(3):530-541. doi: 10.1016/j.ejpn.2017.01.001. Epub 2017 Jan 14. PMID: 28109652 [PubMed – indexed for MEDLINE]. Abstract. Feldhaus B, Kohl S, Hörtnagel K, Weisschuh N, Zobor D. Novel homozygous mutation in the SPATA7 gene causes autosomal recessive retinal degeneration in a consanguineous German family. Ophthalmic Genet. 2017 May 8:1-4. doi: 10.1080/13816810.2017.1318925. PMID: 28424919. Abstract. Grimm A, Winter N, Wolking S, Vittore D, Biskup S, Axer H. Nerve enlargement in an unusual case of inflammatory neuropathy and new gene mutation-morphology is the key. Ophthalmic Genet. 2017 May 8:1-4. doi: 10.1080/13816810.2017.1318925. PMID: 28481129. Abstract. Wolff M, Johannesen KM, Hedrich UBS, Masnada S, Rubboli G, Gardella E, Lesca G, Ville D, Milh M, Villard L, Afenjar A, Chantot-Bastaraud S, Mignot C, Lardennois C, Nava C, Schwarz N, Gérard M, Perrin L, Doummar D, Auvin S, Miranda MJ, Hempel M, Brilstra E, Knoers N, Verbeek N, van Kempen M, Braun KP, Mancini G, Biskup S, Hörtnagel K, Döcker M, Bast T, Loddenkemper T, Wong-Kisiel L, Baumeister FM, Fazeli W, Striano P, Dilena R, Fontana E, Zara F, Kurlemann G, Klepper J, Thoene JG, Arndt DH, Deconinck N, Schmitt-Mechelke T, Maier O, Muhle H, Wical B, Finetti C, Brückner R, Pietz J, Golla G, Jillella D, Linnet KM, Charles P, Moog U, Õiglane-Shlik E, Mantovani JF, Park K, Deprez M, Lederer D, Mary S, Scalais E, Selim L, Van Coster R, Lagae L, Nikanorova M, Hjalgrim H, Korenke GC, Trivisano M, Specchio N, Ceulemans B, Dorn T, Helbig KL, Hardies K, Stamberger H, de Jonghe P, Weckhuysen S, Lemke JR, Krägeloh-Mann I, Helbig I, Kluger G, Lerche H, Møller RS. Genetic and phenotypic heterogeneity suggest therapeutic implications in SCN2A-related disorders. Brain. 2017 May 1;140(5):1316-1336. doi: 10.1093/brain/awx054. PMID: 28379373. Abstract. Platzer K, Yuan H, Schütz H, Winschel A, Chen W, Hu C, Kusumoto H, Heyne HO, Helbig KL, Tang S, Willing MC, Tinkle BT, Adams DJ, Depienne C, Keren B, Mignot C, Frengen E, Strømme P, Biskup S, Döcker D, Strom TM, Mefford HC, Myers CT, Muir AM, LaCroix A, Sadleir L, Scheffer IE, Brilstra E, van Haelst MM, van der Smagt JJ, Bok LA, Møller RS, Jensen UB, Millichap JJ, Berg AT, Goldberg EM, De Bie I, Fox S, Major P, Jones JR, Zackai EH, Abou Jamra R, Rolfs A, Leventer RJ, Lawson JA, Roscioli T, Jansen FE, Ranza E, Korff CM, Lehesjoki AE, Courage C, Linnankivi T, Smith DR, Stanley C, Mintz M, McKnight D, Decker A, Tan WH, Tarnopolsky MA, Brady LI, Wolff M, Dondit L, Pedro HF, Parisotto SE, Jones KL, Patel AD, Franz DN, Vanzo R, Marco E, Ranells JD, Di Donato N, Dobyns WB, Laube B, Traynelis SF, Lemke JR.GRIN2B encephalopathy: novel findings on phenotype, variant clustering, functional consequences and treatment aspects. J Med Genet. 2017 Apr 4. pii: jmedgenet-2016-104509. doi: 10.1136/jmedgenet-2016-104509. PMID: 28377535. Logeswaran T, Friedburg C, Hofmann K, Akintuerk H, Biskup S, Graef M, Rad A, Weber A, Neubauer BA, Schranz D, Bouvagnet P, Lorenz B, Hahn A. (2017). Two patients with the heterozygous R189H mutation in ACTA2 and Complex congenital heart defects expands the cardiac phenotype of multisystemic smooth muscle dysfunction syndrome.Am J Med Genet A. 2017 Apr;173(4):959-965. doi: 10.1002/ajmg.a.38102. Hoelz H, Coppenrath E, Hoertnagel K, Roser T, Tacke M, Gerstl L, Borggraefe I, Childhood-Onset Epileptic Encephalopathy Associated With Isolated Focal Cortical Dysplasia and a Novel TSC1 Germline Mutation.Clin EEG Neurosci. 2017 Mar 1:1550059417697841. doi: 10.1177/1550059417697841. [Epub ahead of print]. Abstract. Walter D, Döring C, Feldhahn M, Battke F, Hartmann S, Winkelmann R, Schneider M, Bankov K, Schnitzbauer A, Zeuzem S, Hansmann ML, Peveling-Oberhag J. Intratumoral heterogeneity of intrahepatic cholangiocarcinoma.Oncotarget. 2017 Feb 28;8(9):14957-14968. doi: 10.18632/oncotarget.14844.PMID: 28146430. Abstract. von Stülpnagel C, Ensslen M, Møller RS, Pal DK, Masnada S, Veggiotti P, Piazza E, Dreesmann M, Hartlieb T, Herberhold T, Hughes E, Koch M, Kutzer C, Hörtnagel K, Nitanda J, Pohl M, Rostásy K, Haack TB, Stöhr K, Kluger G, Borggraefe I. (2017). Epilepsy in patients with GRIN2A alterations: Genetics, neurodevelopment, epileptic phenotype and response to anticonvulsive drugs. Eur J Paediatr Neurol. 2017 Jan 14. doi: 10.1016/j.ejpn.2017.01.001. PMID: 28109652. Abstract. Michelis JP, Hattingen E, Gaertner FC, Minnerop M, Träber F, Biskup S, Klockgether T, Paus S. (2017). Expanded phenotype and hippocampal involvement in a novel compound heterozygosity of adult PLA2G6 associated neurodegeneration (PARK14). Parkinsonism Relat Disord. 2017 Jan 10. doi: 10.1016/j.parkreldis.2017.01.005. PMID: 28094106. Abstract. Karin I, Borggraefe I, Catarino CB, Kuhm C, Hörtnagel K, Biskup S, Opladen T, Blau N, Heinen F, Klopstock T. (2017). Folinic acid therapy in cerebral folate deficiency: marked improvement in an adult patient. J Neurol. 2017 Jan 4. doi: 10.1007/s00415-016-8387-6. PMID: 28054128. Abstract. Schubert V, Auffenberg E, Biskup S, Jurkat-Rott K, Freilinger T. Two novel families with hemiplegic migraine caused by recurrent SCN1A mutation p.F1499L. Cephalalgia. 2017 Jan 1:333102417742365. doi: 10.1177/0333102417742365. [Epub ahead of print]. Abstract. Bonifert T, Gonzalez Menendez I, Battke F, Theurer Y, Synofzik M, Schöls L, Wissinger B. Antisense Oligonucleotide Mediated Splice Correction of a Deep Intronic Mutation in OPA1. Mol Ther Nucleic Acids. 2016 Nov 22;5(11):e390. doi: 10.1038/mtna.2016.93. Abstract. Linnebank M, McDougall CG, Krüger S, Biskup S, Neumann M, Weller M, Valavanis A, Prudlo J. (2016). Novel cases of amyotrophic lateral sclerosis after treatment of cerebral arteriovenous malformationss. Swiss Med Wkly. 2016 Nov 12;146:w14361. doi: 10.4414/smw.2016.14361. Abstract. Krüger S, Battke F, Sprecher A, Munz M, Synofzik M, Schöls L, Gasser T, Grehl T, Prudlo J, Biskup S. (2016). Rare Variants in Neurodegeneration Associated Genes Revealed by Targeted Panel Sequencing in a German ALS Cohort. Front Mol Neurosci. 2016 Oct 13;9:92. PMID: 27790088. Abstract. Li D, Yuan H, Ortiz-Gonzalez XR, Marsh ED, Tian L, McCormick EM, Kosobucki GJ, Chen W, Schulien AJ, Chiavacci R, Tankovic A, Naase C, Brueckner F, von Stülpnagel-Steinbeis C, Hu C, Kusumoto H, Hedrich UB, Elsen G, Hörtnagel K, Aizenman E, Lemke JR, Hakonarson H, Traynelis SF, Falk MJ. (2016). GRIN2D Recurrent De Novo Dominant Mutation Causes a Severe Epileptic Encephalopathy Treatable with NMDA Receptor Channel Blockers. Am J Hum Genet. 2016 Oct 6;99(4):802-816. doi: 10.1016/j.ajhg.2016.07.013. PMID: 27616483. Mohammad S, Wolfe LA, Stöbe P, Biskup S, Wainwright MS, Melin-Aldana H, Malladi P, Muenke M, Gahl WA, Whitington PF. (2016). Infantile Cirrhosis, Growth Impairment, and Neurodevelopmental Anomalies Associated with Deficiency of PPP1R15B. J Pediatr. 2016 Sep 15. pii: S0022-3476(16)30722-3. doi: 10.1016/j.jpeds.2016.08.043. PMID: 27640355. Hogrebe M, Murakami Y, Wild M, Ahlmann M, Biskup S, Hörtnagel K, Grüneberg M, Reunert J, Linden T, Kinoshita T, Marquardt T. (2016). A novel mutation in PIGW causes glycosylphosphatidylinositol deficiency without hyperphosphatasia. Am J Med Genet A. 2016 Sep 14. doi: 10.1002/ajmg.a.37950. PMID: 27626616. Syrbe S, Zhorov BS, Bertsche A, Bernhard MK, Hornemann F, Mütze U, Hoffmann J, Hörtnagel K, Kiess W, Hirsch FW, Lemke JR, Merkenschlager A. (2016). Phenotypic Variability from Benign Infantile Epilepsy to Ohtahara Syndrome Associated with a Novel Mutation in SCN2A. Mol Syndromol. 2016 Sep;7(4):182-188. PMID: 27781028. Johannesen K, Marini C, Pfeffer S, Møller RS, Dorn T, Niturad C, Gardella E, Weber Y, Søndergård M, Hjalgrim H, Nikanorova M, Becker F, Larsen LH, Dahl HA, Maier O, Mei D, Biskup S, Klein KM, Reif PS, Rosenow F, Elias AF, Hudson C, Helbig KL, Schubert-Bast S, Scordo MR, Craiu D, Djémié T, Hoffman-Zacharska D, Caglayan H, Helbig I, Serratosa J, Striano P, De Jonghe P, Weckhuysen S, Suls A, Muru K, Talvik I, Talvik T, Muhle H, Borggraefe I, Rost I, Guerrini R, Lerche H, Lemke JR, Rubboli G, Maljevic S. (2016). Phenotypic spectrum of GABRA1: From generalized epilepsies to severe epileptic encephalopathies. Neurology. 2016 Aug 12. pii: 10.1212/WNL.0000000000003087. Hörtnagel K, Krägeloh-Mann I, Bornemann A, Döcker M, Biskup S, Mayrhofer H, Battke F, du Bois G, Harzer K. (2016). The second report of a new hypomyelinating disease due to a defect in the VPS11 gene discloses a massive lysosomal involvement. J Inherit Metab Dis. 2016 Jul 29. PMID: 27473128. Soehn AS, Rattay TW, Beck-Wödl S, Schäferhoff K, Monk D, Döbler-Neumann M, Hörtnagel K, Schlüter A, Ruiz M, Pujol A, Züchner S, Riess O, Schüle R, Bauer P, Schöls L. (2016). Uniparental disomy of chromosome 16 unmasks recessive mutations of FA2H/SPG35 in 4 families. Neurology. 2016 Jul 12;87(2):186-91. doi: 10.1212/WNL.0000000000002843. Epub 2016 Jun 17. Balestrini S, Milh M, Castiglioni C, Lüthy K, Finelli MJ, Verstreken P, Cardon A, Stražišar BG, Holder JL Jr, Lesca G, Mancardi MM, Poulat AL, Repetto GM, Banka S, Bilo L, Birkeland LE, Bosch F, Brockmann K, Cross JH, Doummar D, Félix TM, Giuliano F, Hori M, Hüning I, Kayserili H, Kini U, Lees MM, Meenakshi G, Mewasingh L, Pagnamenta AT, Peluso S, Mey A, Rice GM, Rosenfeld JA, Taylor JC, Troester MM, Stanley CM, Ville D, Walkiewicz M, Falace A, Fassio A, Lemke JR, Biskup S, Tardif J, Ajeawung NF, Tolun A, Corbett M, Gecz J, Afawi Z, Howell KB, Oliver KL, Berkovic SF, Scheffer IE, de Falco FA, Oliver PL, Striano P, Zara F, Campeau PM, Sisodiya SM. (2016). TBC1D24 genotype-phenotype correlation: Epilepsies and other neurologic features. Neurology.2016 Jul 5;87(1):77-85. doi: 10.1212/WNL.0000000000002807. Epub 2016 Jun 8. PMID: 27281533.